For most new residents to South Fulton, any reference to Sandtown evokes thoughts of Sandtown Park, Sandtown Church or the former Sandtown Elementary School, now A. Philip Randolph. As late as 1950, County maps recognized Sandown’s boundaries as bordered by the City of Atlanta and extending on Campbellton Road from Enon Road to the Chattahoochee River (Douglass County). Others can remember when Campbell's Grocery at the corner of Boat Rock and Campbellton was the local source of shopping for the community. At the same time, Sandown’s crossroads were near Boat Rock and Cascade. Fulton Industrial was not even on the maps until the 60’s. To understand the Sandtown story, one must also understand some of the history of Creek Indians in the South. The Creeks were one of 19 tribal groups that once lived in Alabama and Georgia. Following the Creek War in 1813, the Creeks were forced to give up huge tracks of land in Alabama and to move in large numbers into Georgia . To get more interesting facts about the Creek Indians click here. Having been forced into Atlanta, the Creeks settled in an area around an island on the Chattahoochee River. Earlier, a group of Creek Indians had named the area "Buzzard Roost." The new group of Creeks chose to name the area "Sandtown" ("Oktahasasi" in Creek). Folklore suggests that the Creeks chose the Sandtown name because of the sandy, rock terrain found in the area. In reality, Sandtown was the name of the town, which the Creeks had originated. The practice of naming a new settlement after an old one was not uncommon. Thus for many years, this frontier community was known by two names, Sand Town and Buzzards Roost. By 1821, the Creeks surrendered more land, which was to become Henry and Dekalb Counties. At the same time, more Euro-American settlers had also come into the area. The Sand Town-Buzzard Roost Community was now a frontier settlement for adventurers and gold seekers going west and as such, Sand Town was wild and undisciplined. In the late 1820's, the name Buzzard's Roost was dropped. In 1928, Sandtown had a post office. Campbell County historians believe that Sandtown was the first community in old Campbell County and the longest continuous community in Fulton County . While the Creek Indians occupied the area South of Atlanta, the Cherokee controlled a large part of Atlanta. With the Indian Removal Act, both the Creeks and Cherokee were forced out of Georgia into Oklahoma. With the Indians gone, the land around Atlanta was now ready for permanent settlement. The City of Atlanta (First name Terminus, then Marthasville and finally Atlanta) grew slowly, while the area in the southwest of Atlanta (Sandtown) remained a farming community of widely dispersed farms. During the Civil War, Union forces used the Sandtown Community as strategic stronghold to launch their war efforts. From the end of the War till Reconstruction on, the history of Sandtown became more fragmented. 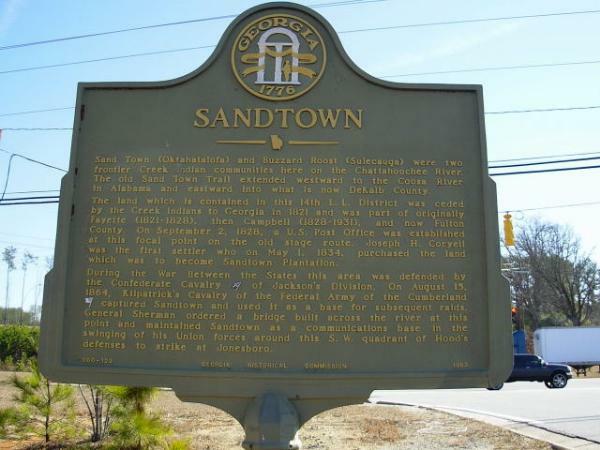 Several historical markers found in the area are noteworthy: The "Sandtown" marker is located on Fulton Industrial Boulevard and Boat Rock Road. It marks the former location of the J.H. Wilson home. Mr. Wilson's daughter married J.M. High of the J.M. High Department Store, a renowned store in the 40's and 50's. The High Museum was named for the High Family. This site is also the location that General Hood launched his defense to destroy Jonesboro during the war. The second marker, "Dry Pond", is located at Boat Rock and Campbellton. The third marker, " Owl Rock Church ," is at the corner of Camp Creek and Campbellton. The church is named for an eight-foot natural rock (identified by the Creeks as resembling an owl), which is in the back of the church, near the cemetery. There are also some less understood parts of Sandtown's history which require further study: First, there is some debate among historians over whether Cascade Road or Campbellton Road represents the old "Sand Town Path." Second, a mid-to-late nineteenth century Gothic Revival house on the Northside of Campbellton Road between Reynolds and Wallace needs to be identified. The community is trying to declare this as a historical home. The house has clapboard siding, lozenge-shaped eaves-vents and shed-roofed porch. There is a large historic wooden barn and storage shed on the property. Third, the community is seeking a means of designating archeologically the huge boulders on Boat Rock Road. Boat Rock Road is named because of one very large boat-shaped boulder on the road and the hard rock in the vicinity. A fourth historical interest is in completing an oral history of Afro-American experiences in Sandtown, which is called ---"If the Timbers Could Talk." Mrs. Snotie Albert, a resident of Sandtown for nearly 60 years, has her own memories of Sandtown. She indicates many Blacks lived in the Boat Rock area but most of the old homes have been torn down. Mrs. Albert adds that two United Methodist churches, Poplar Springs (Cascade Road) and Rocky Head (Old Campbell Road ) were very important to the African American community. She also has vivid memories of the “one room colored school house" attached to each these churches in the 40's by a private foundation. Her son attended Poplar Springs School until public schools were available to him through public county funds. The Poplar Springs School building remains, but the Rocky Head School has been demolished. Children and teachers walked as far as Ben Hill Community to attend these schools. Sandtown is a growing community with several new housing developments. The largest development, the Sandtown Center, is a new urbanite project approved by the Board of Commissioners on November 7, 20001. The Sandtown Center is a result of a developer and community collaboration following a bitter fight three years ago when the option was building 1400 apartments. An umbrella organization, the Sandtown Homeowners’ Association, attempts to work proactively in the community to assure quality development. The Association has been instrumental in several community issues. One lengthy and ongoing fight has been to have quality roads in the Sandtown Community. In 1998, Sandtown joined with Ben Hill to form the Campbellton Road Coalition (CRC). CRC’s argument was that the DOT design of “one size fits all” was inappropriate for Campbellton Road. CRC felt strongly that changes to Campbellton Road were essential, but that an unbiased expert opinion was needed to develop a safe and progressive alternative to the DOT design. Through grants obtained from Fulton County and the City of Atlanta , CRC was able to receive input from national experts such as Bill de St. Aubin of The Sizemore Group in Atlanta , Walter Kulash and Ian Lockwood of Glatting Jackson in Florida. Negotiations with the DOT are ongoing. The Sandtown Homeowners’ Association has also developed a business overlay for Sandtown. The overlay sets standards for all business development in the community. Community identity will be encouraged through gateways and street toppers. Most street toppers were installed. The “Sandtown Topper Drive” had as its goal to have every neighborhood adopt a Sandtown Toppers for their street. Toppers are still available.